Here's how this small medical device company is helping to tackle diabetes and why it might be worth buying in your portfolio. 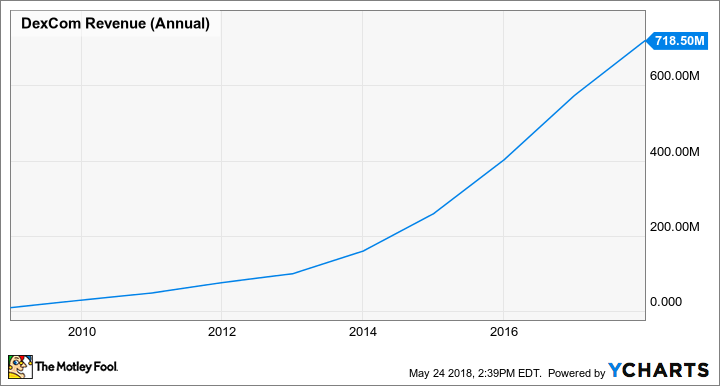 DexCom, Inc. (NASDAQ:DXCM) is a medical device company that pioneered the development of continuous glucose monitors (CGM) used by diabetics to more accurately track their blood glucose levels and control their disease. Founded in 1999, DexCom competes against industry titans Medtronic (NYSE:MDT) and Abbott Labs (NYSE:ABT) in an addressable market that totals more than 30 million diabetics in the United States alone. 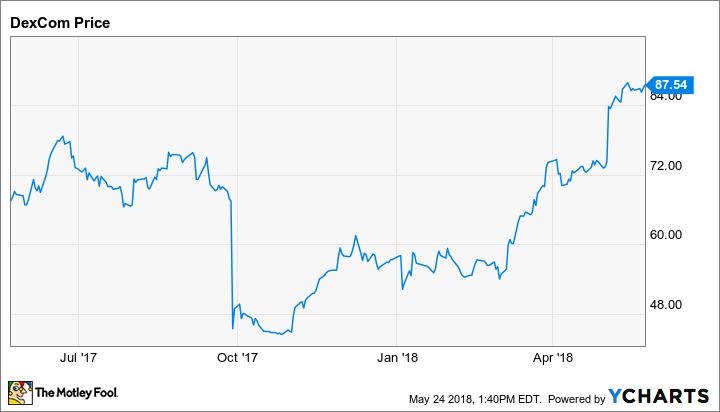 Given there are 1.5 million new cases of diabetes diagnosed every year in America, and the number of people with diabetes is expected to eclipse 50 million by 2030, does DexCom deserve to be a top stock for growth investors to buy? When functioning normally, the pancreas releases insulin after we eat to convert glucose into stored energy. However, in patients with diabetes, the pancreas either doesn't produce any or enough insulin (type 1 diabetes) or the body has developed a resistance to the insulin it produces (type 2 diabetes). Resulting from genetic or environmental factors, type 1 diabetes is typically diagnosed in childhood or in adolescence. A lifelong disease, type 1 diabetes requires chronic blood glucose monitoring and regular insulin dosing to prevent the buildup of blood sugar that can lead to a series of health problems. Type 2 diabetes is usually diagnosed later in life than type 1 and while the cause of type 2 diabetes isn't fully understood, a person's genetics and lifestyle are considered contributing factors to developing insulin resistance. The most common type of diabetes, type 2 diabetes accounts for about 95% of diabetes patients. While type 2 patients don't have as intensive of a regimen for monitoring their blood sugar, these patients often progress to requiring insulin and ongoing analysis of blood sugar levels is critical. Absent adequate monitoring and the correct use of insulin, diabetes patients are at risk of developing a variety of health problems, including nerve damage that can lead to amputation, vision loss that can lead to blindness, and life-threatening kidney disease and cardiovascular disease. According to the World Health Organization (WHO), adults with diabetes have a two- to threefold higher risk of heart attack and stroke than their nondiabetic peers. Diabetes is the seventh leading cause of death and overall, the average life expectancy of someone with diabetes at age 50 is reduced by nearly nine years. There are 30.3 million Americans living with diabetes in America, according to the Centers for Disease Control (CDC), and globally, the addressable patient population eclipses 422 million, up from 108 million in 1980, according to WHO. The number of people with diabetes is expected to increase substantially over the coming decade, and as a result, the total costs associated with treating it is forecast to skyrocket. Research from the Institute for Alternative Futures (IAF) concludes that the number of people with diagnosed or undiagnosed diabetes in the U.S. will reach 54.9 million by 2030 and that spending on diabetes will increase to $622 billion in 2030 from $408 billion in 2015. Medications, including metformin, are widely used to help keep blood glucose levels from causing life-threatening problems in type 2 patients, but the most critical component of keeping diabetes in check for type 1 patients is accurate monitoring and insulin dosing to avoid dangerously high (hyperglycemia) or low (hypoglycemia) levels of blood sugar. Usually, type 1 and type 2 diabetes patients evaluate their blood sugar levels by using finger sticks to collect a small blood sample that can be analyzed by a glucose meter. Because type 1 diabetics produce very little or no insulin, they undergo this routine four to 10 times per day, including prior to eating, before and after exercising, and before falling asleep. Regular checks of blood sugar during the night aren't uncommon, either. Type 2 diabetics don't require as intensive of monitoring but they still check their blood sugar levels often, including around mealtimes. Despite regularly checking blood sugar with finger sticks, studies show most diabetes patients spend 70% of every day outside of the healthy range for blood sugar, and as a result, are at a greater risk of diabetes causing life-threatening problems. Recognizing that finger sticks and glucose metering fall short for many people, DexCom was founded in 1999 with a singular mission: to develop medical devices that continuously monitor blood glucose levels so that patients can better determine when they should be taking their insulin. Until 2003, DexCom's research focused primarily on developing implantable sensors that could remain in the body for an extended time. But in 2004, growing concern that the company would face challenges gaining approval for a long-term implant solution that was more invasive and costly than traditional finger sticks, led to the development of short-term, temporary sensors that can be attached to the skin. In 2005, DexCom raised $56.4 million in an IPO on the Nasdaq to fund clinical trials of its short- and long-term system. The short-term sensor and CGM solution -- the STS continuous glucose monitoring (CGM) system -- won FDA approval in 2006 after trials demonstrated patients spent less time outside a normal healthy blood sugar range while using it. The long-term implant solution, however, was halted after the company "evaluated several months of data from feasibility studies" and determined the product "didn't warrant investing in a large pivotal trial." In short, creating a reliable long-term device that would pass muster with regulators, payers, and patients was too difficult a challenge to overcome, particularly given the successful launch of the short-term sensor solution, which was a revolutionary advance in its own right. The short-term STS system used tiny wire-like sensors that were inserted by the patient just under the skin that could be worn for three days. Data collected by these sensors was reported wirelessly to the STS receiver, where it was charted and displayed in a graph to patients. To help patients know when their blood glucose levels were too high or too low, the STS system also included a feature that triggered alerts. The company's second-generation product, the seven-day STS CGM system, got the FDA's nod in 2007. That system increased the time sensors could be worn by diabetics from three to seven days and it included a feature that allowed patients to download their glucose level data to a computer for review. These early systems provided revolutionary insight to patients but didn't begin to gain widespread adoption until 2008, when results from a Juvenile Diabetes Research Foundation trial were unveiled. In its 322-person trial, CGMs significantly improved glucose control without hypoglycemia. The study was important because it reduced worry that the use of CGM's could cause patients to take too much insulin. Thanks in part to a growing body of evidence supporting the use of CGMs, DexCom's sales began to accelerate. In 2008, sales climbed 76% to $8.1 million and by 2011, sales were topping $40 million. The rapid run-up in sales allowed DexCom to plow more money into research and development, and that spending led to the development of its next generation of CGMs, the G-series. The company's first G-series CGM was the G4 Platinum, which won FDA approval in 2012. The G4 was smaller than the STS systems preceding it, and it improved hypoglycemic accuracy by 30%. The improvement in accuracy is important because CGM's don't measure glucose levels through the bloodstream. Instead, they do so through the interstitium, a fluid-filled space just under the skin. Because CGM sensors are inserted into the interstitium, the CGM's software contains code that deduces actual blood sugar levels from the sensor readings at points in time. Absent greater accuracy, patients were still at risk of taking too much insulin, which can cause hypoglycemia. The G4 also offered a longer transmission range between its sensors and the receiver and a more user-friendly color LCD display than previous devices. In 2015, DexCom followed up the G4 with the G5. The G5 allowed patients to see real-time data on either a DexCom receiver or on any compatible device, including smartphones, via an app. The G5 also included an option to securely share real-time data with a caregiver, such as a parent, and it provided access to a cloud-based repository where data could be stored for review. Importantly, the G5 was the first DexCom CGM to do away with the need to confirm CGM readings with finger sticks prior to taking insulin. Although finger sticks were still necessary every 12 hours to calibrate the system, the advance significantly reduced the burden of finger sticks on patients. Ongoing technological advances, such as the G4 and G5, alongside growing acceptance of CGMs generally, has been a boon to the company's top line. Since 2008, DexCom's annual sales have increased from less than $10 million to $718.5 million in 2017 -- a compounded annual growth of nearly 57%. DXCM Revenue (Annual) data by YCharts. DexCom isn't the only company profiting from continuous glucose monitoring systems. Medtronic and Abbott Labs are deep-pocketed foes and each has recently launched compelling new devices for diabetes that challenge DexCom. After securing an unexpected early approval in 2016, Medtronic launched its MiniMed 670G in 2017. The MiniMed 670G is the world's first closed-loop monitoring and insulin dosing system to win the regulatory green light. It combines Medtronic's Guardian CGM and Medtronic's insulin pump in a system that automatically measures blood glucose levels every five minutes and then, automatically doses insulin when it's necessary. The MiniMed 670G marks a major advance in treating diabetics requiring extensive monitoring and so far, it's a hit. In Medtronic's 2018 fiscal fourth quarter, diabetes revenue rose 26% to $645 million because of the system. Abbott Labs is also riding a wave of growing demand following the approval of its latest CGM, the Freestyle Libre. When the Freestyle Libre won FDA approval in 2017, it became the first CGM approved that didn't require daily finger sticks for calibration. The device's sensors do have a 12-hour warm-up period in which data isn't recorded, however, so finger sticks are necessary during that period. The Freestyle Libre launched at a lower price point than DexCom's G5 and since it eliminated the need for finger sticks for calibration, it's become a commercial success. As of March 2018, 650,000 patients were using the Freestyle Libre and 50,000 new patients were being added monthly. Abbott hasn't said specifically how much money the Freestyle Libre's contributing to its top-line, but it has said that it was responsible for a 30% increase in its diabetes revenue in Q1 2018. Abbott Labs reports its diabetes sales in its "other" category and in Q1 2018, "other" revenue accounted for $430 million of Abbott Labs $7.4 billion in total sales. As you can see in the following chart, the 2017 approval of Abbott's Freestyle Libre took a toll on DexCom's share price. However, the sell-off proved temporary as the company's shares rallied sharply following the FDA approval of DexCom's latest CGM, the G6, in March 2018. The G6 is arguably more feature-rich than the Freestyle Libre. Like the Freestyle Libre, DexCom's G6 eliminates the need for finger sticks, but unlike Abbott Labs' CGM, the G6's sensors only have a two-hour warm-up period. The G6 automatically communicates data between its sensors and a receiver and the receiver can be a smartphone or similar device, too. Alternatively, Abbott's receiver has to be held within 1.5 inches of its sensors to transfer data and there's no app yet that allows patients to use a smartphone or tablet as the receiver. Furthermore, the G6 warns patients of dangerous glucose readings with an alarm, while the Freestyle Libre doesn't. The G6 system uses smaller sensors than DexCom's G5 and its sensors can be applied to the skin with a new one-touch applicator that's easier to use. Additionally, the G6's sensors can be worn for 10 days while the G5 sensors are only approved for seven days of use. G6's features could help DexCom outcompete the Freestyle Libre, but what's most exciting about the G6 is that it's the first CGM to win FDA approval as a stand-alone system or as a CGM for use in automated insulin dosing systems. Currently, Medtronic is the only company marketing a closed-loop monitoring and insulin dosing system (the aforementioned MiniMed 670G), but insulin pump makers Insulet (NASDAQ:PODD) and Tandem Diabetes (NASDAQ:TNDM) are working on their own closed-loop systems and those systems are being designed for use with DexCom's CGMs. Studies for a system that pairs up the G5 with Insulet's Omnipod insulin pump are underway, and according to management, its closed-loop system could reach the market as soon as late 2019. Meanwhile, Tandem Diabetes is even closer to the finish line. Its t:slim X2 insulin pump is the only pump approved for use with DexCom's G5 that doesn't require finger sticks prior to dosing insulin, and Tandem says an FDA approval of a closed-loop system using the G5 could come as soon as the summer of 2018. An OK for a system that incorporates the G6 could be available by the end of 2018 or early 2019, too. The potential associated with DexCom's G6 isn't limited to those two solutions, though. DexCom is looking at pairing it up with other solutions, such as smart insulin pens or apps, too. DexCom's innovation isn't going to stop with the G6, either. The company's working closely with Alphabet (NASDAQ:GOOG)(NASDAQ:GOOGL) healthcare spinoff Verily on disposable CGM solutions that could find their way to the market in 2020. Is DexCom a stock to buy? DexCom is at the forefront of CGM technology and its strategy of working with any insulin delivery system could help it win more market share over time. The company isn't profitable yet, though, and there's no guarantee its sales will reach the levels necessary to produce consistent earnings. Nevertheless, the sheer size of the addressable market for diabetes medical devices and a single-digit penetration rate for CGMs in that market suggest there's plenty of potential for revenue to climb high enough for DexCom to eventually reward shareholders with profits. Undeniably, DexCom's got heavyweight competition from Medtronic and Abbott Labs, but unlike those companies, it's a pure player in this market. If CGMs become a standard used alongside insulin delivery to treat diabetes patients, then its investors could benefit substantially. For that reason, I think it's worth owning.